The Silsden Brass Band led the procession of ex-servicemen to the unveiling of the Silsden War Memorial on 12th November 1921. Among the 200 wreaths and floral tributes laid at the memorial was one that read ‘In Remembrance of Fred Taylor from the members of Silsden Brass Band, honouring him as a former member of the Band. The unveiling was done by fifteen children, eight girls and seven boys, whose fathers’ had died in the Great War, together with Miss Hannah Faulkner whose tragedy epitomises the effect of the conflict on local communities. She had lost three brothers, while a fourth was described as ‘maimed for life’. Each child pulled a cord which collectively released a covering to reveal the memorial. Keighley News 6th August 1921. The members of the Silsden Brass Band, along with a number of friends, took part in a charabanc tour on Sunday. The party numbering about 70 left Silsden at 7 a.m. and journeying by way of Kildwick, Skipton and Hellifield, reached Settle shortly before 9 o’clock. At the latter place selections were rendered by the band in the market square, and were listened to by a very good audience. Leaving Settle, the party proceeded to Kirby Lonsdale, where after dinner, the band marched through the town to the parade ground playing on the way, by special request, the march arranged by the late Mr Edward Newton (Silsden) entitled ‘True Till Death’. The band went through a full programme of music before a large audience, and also played by request, ‘The Pirates of Penzance’, for which they received an enthusiastic encore responding with the late Mr Newton’s setting of ‘Realms of Bliss’. After tea they journeyed to Ingleton, where another programme was gone through in the football field before a large gathering. On leaving the football field the band formed up and played that stirring march ‘Sons of The Brave’ the crowd following until the charabancs were reached at the top of the town. Home was reached shortly after 11 o’clock after a most enjoyable day. The band fund was considerably augmented as a result of the concerts given during the day. The district covered was familiar to members of the old Silsden Band, some of whom were amongst the party and were able to renew acquaintance with a good many old friends. Many appreciative references were made during the day to the bands efforts which it was said were reminiscent of those of the old band of thirty years ago. The conductor was Mr R Murgatroyd (Bandmaster). Keighley News September 24th 1921. The annual meeting of the Silsden Brass Band was held recently at the bandroom in Skipton Road, Mr J Hunter presiding. 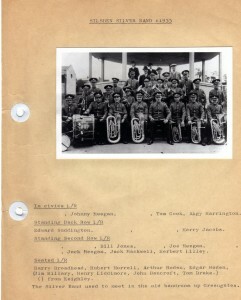 The report presented by the secretary (Mr N Murgatroyd) stated that the band had a very successful year. The financial statement as presented by Mr A Roden (Treasurer) showed the income to have been £205 and the expenditure £168 leaving a balance in hand of over £36 which was considered very satisfactory. The officers elected were as follows:- Bandmaster Mr N Murgatroyd, Deputy Bandmaster Mr W Whitaker, Secretary Mr J Bradley, Treasurer Mr A Roden, Librarian Mr W Whitaker, Caretaker Mr V Hudson, Committee (outside members) Messrs J Hunter, Chairman E Booth, J Baldwin, F Green, T Hudson, T Saddington, G Bradley(Daisy Hill), G Bradley (Tufton Street), Band Members Messrs E Craven, W Whitaker, J Clarkson, S Lane, W Atkinson, J Jowett and H Roberts. It was the unanimous opinion that the past year had been one of the most successful for a long time. Octanarian Bandsman’s Death – Mr Samuel Newton of Silsden. Keighley News January 21st 1922. The death of a well known bandsman in the person of Mr Samuel Newton took place at his residence Bridge Street Silsden on Sunday morning. The deceased who had attained the age of eighty years, had had an interesting musical career. He was one of a family of four brothers, three of whom, including the deceased took a great interest in brass bands. When the Crimean War broke out most of the members of the Silsden Band with some other musicians engaged with the 1st Royal Lancashire Militia to become the Band of the Regiment. Lancaster being the Headquarters. When peace was declared the regiment returned to Lancaster and some of the Silsden bandsmen, including Mr Newton, returned home, settled down and formed a band. He was a member of the original brass band which went under the name of ‘The Old Silsden Band’. His active association with brass bands at Silsden extended over a large number of years and it was only a few years ago that he ceased to be a player on account of old age. In his younger days he was a well known euphonium player on which instrument he had a good reputation. Although he did not aspire to the eminence of his brother the late Mr Edward Newton (whose musical compositions are known the world over) Sammy, by which name he was known locally always had the interests of the Silsden Band at heart and it was largely through his enthusiasm coupled with that of his colleagues that The Old Band had such a successful career. His outstanding personality made him a familiar figure in the town. The funeral took place in Silsden on Tuesday afternoon. As the cortege proceeded to the Primitive Methodist Church the tune ‘Departed’ was trumpeted by Messrs H Roberts and E Saddington (members of the Silsden Brass Band). Among the former members of the Silsden Brass Band present were Messrs G Laycock, J Baldwin, R Bradley, E Clarkson, J Townson, J Taylor, W D Townson (Bradford), T Driver (Accrington), J Tillotson (Nelson) and J L Vickers (a former Band Master). In addition to those already mentioned were Messrs M Murgatroyd (Band Master), W Whitaker and J Clarkson, Mr F Metcalfe (Skipton) also attended. Silsden Brass Band Lead Football Celebrations. Keighley News April 29th 1922. The Silsden football team had a rousing reception on their return to Silsden on Saturday evening. The Silsden Band met the victorious team and their contingent of supporters in Keighley Road and the procession proceeded to Bolton Road end the cup being displayed in the front of the Charabancs. Mr W M Watson remarked that 32 years ago when the Keighley Cup Competition was first instituted Silsden were the winners. The Town Hall was thrown open for a free dance at which there was a crowded gathering the music being supplied by the Silsden Brass Band and Mr E Lee discharging the ceremonial duties. Keighley News February 11th 1922. The Silsden Brass Band held a quartet contest at the Town Hall on Saturday evening . There were eight entries and all turned up with the exception of Keighley Borough. Amongst them were two quartet parties from the Black Dyke Band. The players had the choice of any Messrs R Smith and Co’s publications as the test piece and in four instances the piece chosen was “Le Prophere”. There was a novel party of four trombones from Brierfield under the leadership of Mr J Tillotson a former well known Silsden bandsman and they played “The North Wind”. A feature of the contest was the splendid performance given by Black Dyke (No 1) and Haworth whose efforts met with hearty applause. The adjudicator was Mr J W Garratt (Denby Dale Huddersfield) who in his remarks at the close of the contest said “he was disappointed with some of the parties, but taking the contest all round there had been some really good playing”. His awards were Black Dyke No 1, Haworth 2, 3 Black Dyke (No 2), 4 Cowling. The Silsden Brass Band on Sunday gave two concerts in the Flatts by permission of Mr and Mrs S Clough. The attendance in the evening was somewhat spoiled by a motor accident which occurred at the top of St Stephens Road just as the concert was about to begin. Keighley News October 21 1925. A crowded audience attended a sacred concert given in the Picture Palace on Sunday evening given by the Silsden Brass Band. The band under the conductorship of Mr G Robinson played several selections and the hymn ‘Rock of Ages’ to the tune by Redhead and local numbers were excellently sung by Miss M Brown (soprano) and Mr H Wilson (tensor), Miss C Saddington was the accompanist. The proceeds were for the band fund. Keighley News December 5th 1925. A concert under the auspices of the Silsden Brass Band was given at the Picture Palace on Sunday evening before a large audience. The band under the conductorship of Mr Gladney Robinson played pieces by Pickersgill, Rossini and Newton, the latter being ‘Beauties of England’ which the late Mr Edward Newton (Silsden) arranged for brass bands and which has served as a test piece at various band contests from time to time. At the close the band played the hymn tune ‘Silver Hill’. A silver collection was taken in aid of the band fund. Craven Herald March 24th 1933. The Silsden Brass Band gave a concert at the Picture Palace on Sunday evening before a large attendance. Miss Eileen Widdup (Soprano), Keighley, sang several songs very pleasingly, including ‘Come Gladsome Spring’ and ‘My Heart is Like a Singing Bird’ and Mr. Bertram Hagar (Tenor), Keighley, gave a number of impressive renderings. He was recalled for ‘My Dream’ and responded with ‘Take A Pair of Sparkling Eyes’ from the Gondoliers. The band under the conductorship of Mr. J. Bancroft played numerous pieces including ‘The Student Prince’ ‘The Blue Prince’ and ‘Hailstorm’. Mr. Bancroft played the solo in the latter. Mr. N. Murgatroyd was the accompanist. Mr. T. Clarkson who presided appealed to the public of Silsden to give their support on behalf of the brass band. He thanked Mr. Clifford Briggs for kindly allowing them the use of the Picture Palace and Mr. A. Read (Manager) for his assistance in making arrangements for the concert. Craven Herald May 5th 1933. Echo of a Silsden Dance. Brass Band request to council. In the council meeting correspondence the Chairman described as rather unusual a letter from Mr. T. Clarkson, secretary of the Silsden Brass Band, in which an appeal was made to the council for a reduction of the amount charged to the band for holding a dance at the Town Hall on Saturday evening last, which was not a success. As the council no doubt knew the effort was on behalf of the Band Instrument Fund. They had been getting their instruments repaired as well as purchasing new ones, which had entailed considerable expense. Their object was to make a good band, and anything the council could do to help them would be greatly appreciated. The clerk said they had been charged the scale price which was £1..11s..3d. Mr. F. Watson ..does the letter state how much they have lost? – the chairman ..no it does not name the amount. – Mr. A. Wilson .. the secretary does not say they have lost money with the dance, but it was not a success. – Mr. J. Drury moved that the matter be taken by committee which was seconded by Mr. C. T. Fletcher and carried. Keighley News 6th May 1933. The Silsden Brass Band held a dance at the Town Hall on Saturday evening when they played old time dance music. Messrs H Fowler and T Cooke officiated as Masters of Ceremonies. The effort which was on behalf of the instrument fund was fairly well attended. Keighley News 27th May 1933. The Silsden Brass Band held another successful dance at the Town Hall on Saturday providing old time music. Master of Ceremonies was Mr T Cook. The effort was on behalf of the instrument fund. 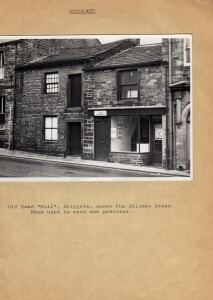 The drawing of the old Silsden Bandroom by Eric Simpson in the 1930’s was thought to be located in the Greengates area of the town near Bradley Road. The band may have used the upper room of the building in the centre of the drawing at the top of the steps. 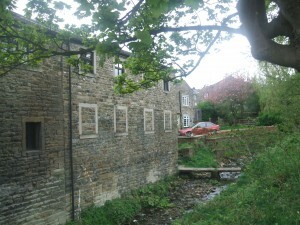 The picture below of the site in Bradley Road reveals that most of the old property has been demolished and replaced by modern dwellings. 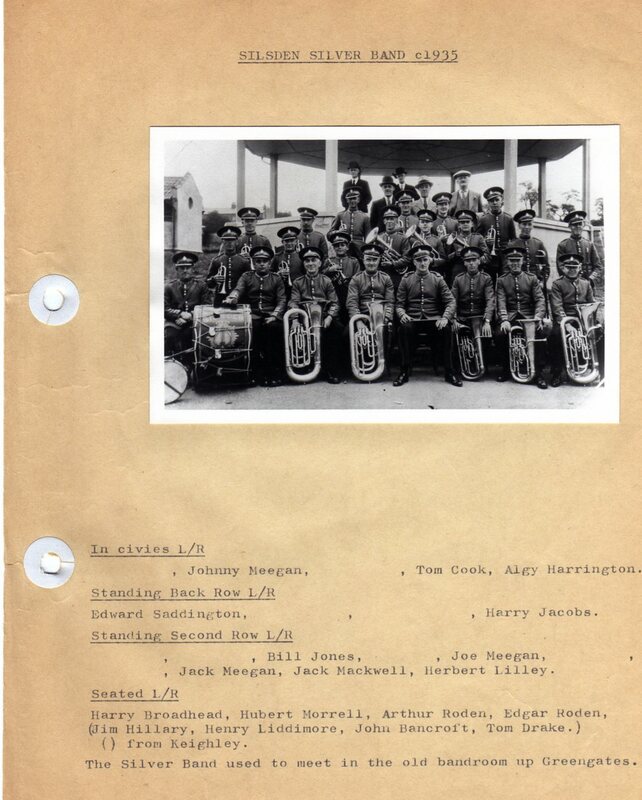 The band became defunct during the Second World War, a local resident remembers that in the 1950’s the instruments were stored in a building near the site of the old British Legion Club. Keighley News July 14th page 13. The Silsden Silver Band under the conductorship of Mr Edward Saddington gave a Sacred Concert in the Silsden playing fields on Sunday evening. A capital programme of music comprised selections, marches and fantasias. The concert was well supported by towns people. Keighley News August 11th page 10. The Silsden Silver Band gave a Sacred concert in the playing fields on Sunday afternoon. A varied programme of music was played under the conductorship of Mr Edward Saddington. The proceeds were in aid of the new uniform fund. Opening of the new playing fields. – Silver Band officiates at the opening of the playing fields. In celebration of the event the plan was for the Silsden Scholars from both the elementary schools to meet in the Aireview School Playground and form a procession and walk to the playing field headed by the Silsden Brass Band ready for the arrival of the Princess Royal. On 29th September on the opening day an estimated three thousand people attended the event but heavy rain dampened the proceedings. After the speeches of the local dignitaries there was a short ceremony of handing the silver key to the Princess, by the architect. Her Royal Highnesses gracious declarations were received with echoing cheers. Selections were then given by the Silsden Silver Band and Silsden Male Voice Choir. Due to the inclement weather many of the planned activities had to be curtailed. Silsden playing fields were opened in September 1934 by the Princess Royal. The facilities will gradually be developed in subsequent years as finances allow. Keighley News 6th May 1935. At a meeting of the Playing Fields Committee in 1935 a gift in the shape of a bandstand was donated, the bandstand had to comply with the general architecture in the grounds. It is to be erected in memory of the late Edward Newton former Band Master at Silsden by members of his family. Mr W Basnett moved that a letter of thanks be sent to donors, and this was seconded by Mr A Wilson and adopted. Keighley News May 11th 1935. Silver Jubilee Procession and Tea. In the afternoon a procession of school children was formed at the Aire View and Hothfield Street Schools and proceeded to the Picture Palace in Bradley Road accompanied by members of The Council of Education Sub-Committee and the Silsden Silver Band. After a display of appropriate pictures the children had tea at the Church Sunday School and the Kirkgate Methodist Sunday School. During the afternoon the Silsden Silver Band played a selection of music at Bolton Road end, under the leadership of Mr J Hillary. Keighley News 18th May 1935. The Silsden Silver Band gave a sacred concert at the Silsden Playing Fields on Sunday afternoon. In spite of the bitterly cold weather a large company attended and a capital programme included the selections ‘In Sunny Lands’, ‘Clarendon’, ‘La Champetre’ and ‘Rohemians’ and at the close hymn tune ‘Silver Hill’ was played. Mr J Hillary was the conductor. Keighley News 25th May 1935. The band gave a concert on Sunday. Items played were ‘Drum Major’, ‘Dessert Song’, ‘Sailors Songs’ and ‘Old Lullaby’ were included. A cornet solo was played by Mr G Ward. The proceeds were for the band fund. Keighley News 12th October 1935. Keighley News 24th August 1935. The Silsden Silver Band along with a number of friends had an enjoyable outing under the ideal weather conditions on Sunday when they travelled in two buses to Ripon. Prior to leaving Silsden they played Parkers Hymn ‘Shipley’ near the cenotaph at Bolton Road End. A stay was made at Knaresborough where they gave a number of selections in the Market Square. Well attended concerts were given afternoon and evening in the Spa Gardens at Ripon. Under the conductorship of Mr J Hillary the band presented capital programmes. In the afternoon they gave the popular selections ’The Student Prince’, and ‘Maritama’ and ‘In Bostonian’. Mr E Smith gave a cornet solo. Other items were from the compositions of Rimmer, Laurient, E La Duc, Greenwood and Parker. The evening programme included selections ‘Echoes of the Opera’, ‘The Desert Song’ and Nichols ‘Cavalcade of Martial Songs’. They also gave ‘The Fantasia’, ‘Spirit of Youth’ by Greenwood. The cornet solo ‘In Nightingale’ was played by Mr G Ward. The performance concluded with the hymn ‘Lavinia’. In Memory of Former Band Master Edward Newton. Members of the Newton family were present at the opening of the bandstand that had been erected in memory of the late Mr Edward Newton by members of the family. His son said that it was not only with great pleasure but with a sense of sincere gratitude that they presented the band stand to the playing fields association for the use of the people of Silsden as a memorial to his father. 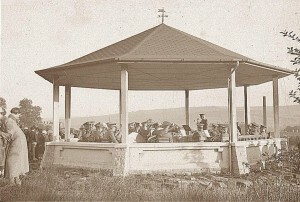 They considered themselves fortunate to have the band stand erected in such a beautiful situation, for it was near there that his father spent the greater part of his life. 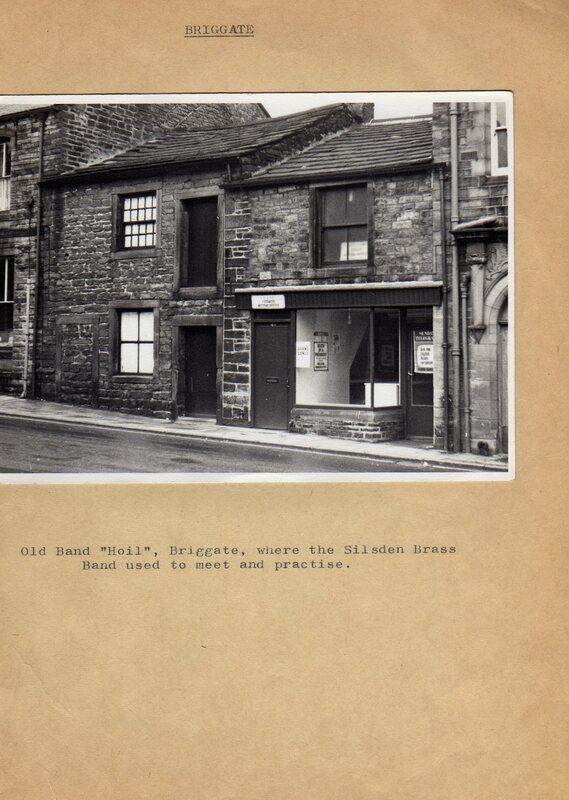 His father was born in Bridge Street, Silsden, and in his early days worked as a nail maker in a little smithy in Stirling Street, and lived in a small cottage up the steps, where some of his sons were born. He afterwards devoted his whole time to musical arrangements and compositions, residing for many years in Bolton Road, and then Browfield Terrace where he passed away. He loved Banklands Lane and the adjoining fields so much that he asked an old friend Mr W H Lambert of Skipton Road to paint him two scenes near the top of the lane. It was there that he found inspiration so often for his musical arrangements. Although his name was not on any Church Membership roll book he loved the House of God, respected its ministers and leaders and gave his support to their various causes. How pleased he was to compose his special hymn tunes for the Kirkgate Methodist Sunday School Anniversary. Those who were old enough to remember know how well they were sung, such hymn tunes as ‘One Sweetly Solemn Thought’, ‘Salam’s Plains’, ‘Safe Home in Port’, ‘Thy Will be Done’, ‘A Few More Years Shall Roll’ and the anthem ‘In Realms of Bliss’. Thousands of copies of which he had printed and sold to Church Choirs all over the country. The bulk of them were also published for brass bands and were freely sold and much appreciated wherever they were played. A former vicar of Silsden the late Rev. Francis Knowles was a friend of his father who set to music two hymns Mr Knowles composed one he named ‘St. James’ after the Silsden Church. As to his public work among brass and military bands his efforts for the musical life of Silsden and district were always appreciated, as was shown by the various gifts to him from time to time, of which he was keenly sensitive and proud. Regarding bandsmen, he not only taught them to be good players but helped them to live good lives. 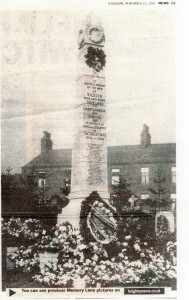 He often talked at home about such bandsmen as J W Shuttleworth, John Tillotson, John Townson, George Laycock, Joseph Taylor, Sugden Lund, William Lloyd (father of Arthur Lloyd of Keighley). James Nicholson (Keighley) and his two brothers Samuel and William Newton among others. They were all good players on their respective instruments. His father held them in high esteem as he did all bandsmen with whom he came in contact, and they in return thought a good deal of Mr Newton. It was that respect and esteem combined with their own family love and regard for him that had prompted them to erect that memorial to his memory. 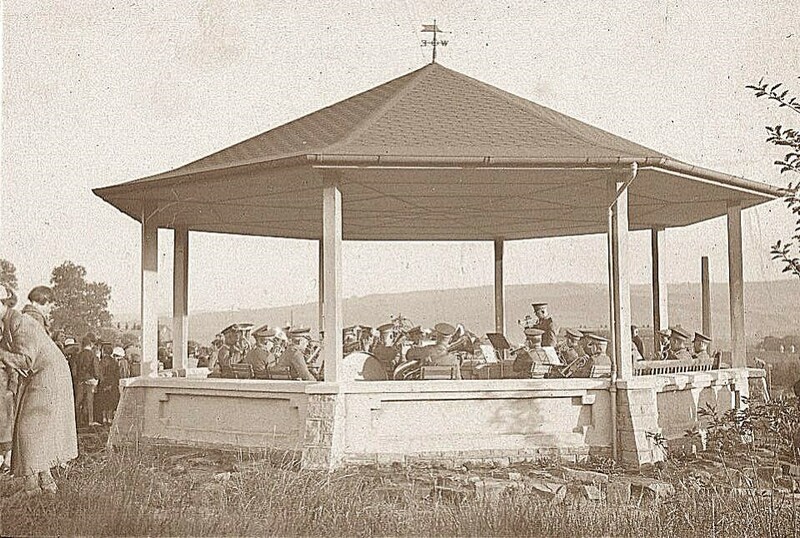 In declaring the band stand open Mr Newton said it was for public use, not only for brass bands, but for all classes of choirs and musical and dramatic societies to give pleasure to the inhabitants of his father’s native town. Mr Sugden Lund an old Silsden bandsman expressed appreciation of Mr E Newton’s life and work and thanks to the family. The Silsden Silver Band under the conductorship of Mr J Hillary went through their pleasing programme of Mr E Newton’s arrangements and compositions. Keighley News February 1st page 13. Mr Albert Drake a member of the Silsden Silver Band gained a special prize for best tenor horn player at a recent contest held in the Shipley Canal Ironworks band-room. Keighley News 11th April page 11. At the fifth annual contest of the West Riding Brass Band Society held at the Victoria Hall Saltaire on Saturday last, the Silsden Silver Band was placed fourth in the Second Section Contest. Mr F Mortimer of Fodens Band was the adjudicator, fifteen bands took part in the contest. Keighley News July 25th page 13. The Silsden Silver Band gave concerts in the playing field on Sunday afternoon and evening. Unfortunately the concert had to be curtailed on each occasion due to the rain. Under the conductorship of Mr J Hillary the band played in the afternoon ‘Hawkins’ March ‘Famous Fragments’. A selection by E. le Duc and Homberg’s ‘Desert Song’, Mr J Ward gave the cornet solo ‘The Nightingale’ (Moss). In the evening the band opened with Aderson’s March ‘First Parade’ repeated the ‘Desert Song’ (by request) and played among other pieces ‘Gems of the Italian Opera’ and ‘Echoes of the Opera’ both by Rimmer. Mr W Burton contributed a cornet solo ‘The Cornet King’. The attendances were adversely affected by bad weather. A further similar concert was performed on 29th August. Keighley News 30th January 1937. Mr Edgar Roden a member of Silsden Silver Band gained the prize for the Best Bass in the Open Section at the Second Annual Contest held by the Canal Iron Works Band (Messrs J Parkinson and Son Shipley) on Saturday. Keighley News 5th June 1937. A concert was given by Silsden Silver Band in the playing field bandstand under the conductor Mr E Saddington. The money raised was for band funds. A further two Sunday concerts conducted by Mr Edward Saddington were performed on July 24th and August 28th 1937. Sunday concerts were also held on 2nd July 1938 and 23rd July. Mr Saddington was the leader at that time. In 1939 there were no reports about the band in the local village section of the Keighley News. It may be that the outbreak of the Second World War helped bring about the band’s demise. After the war there were attempts to restart a new brass band in Silsden but there was never enough interest to bring this about.